It will be unique and humorous if you greet your friends or dear ones by Funny Wedding Wishes and messages to make them laugh on such a special moment of their life like wedding day. Make it cleverly, add some sarcasm and humor into funny wedding wishes messages to give the newlyweds something interesting to start their married life with lots of laugh. Go beyond the normal or traditional way of wedding wishes and greetings moreover you don’t need to be serious and formal every time. Better you try these Funny wedding wishes to congratulate your best friend, dear colleague, boss, relative or any close ones who finally planed for settled down and going to start a new phase of life as a married couple. I knew you two were madly in love with each other but didn’t think that you’ll be mad enough to marry. Have a great life ahead. Marriage is like walking in the park of senseless animals and consider yourself Jurassic king if you have a bit sense. Anyways happy Married Life. Two become One: one bed, one remote, one bathroom! Congratulations on your union as life partners! You fantasize about lovely and beautiful things for your marriage, soon you will dream about living alone surrounded with motionless hands of time. Just kidding. Enjoy your wedding. You are actually shown some respect when priests asks you to say ‘I do’. Else it’s not that you have any other choice either. Happy Married Life Ahead! In the circus of life, you may have lived like a lion so far. But your wife, the new circus master will tame you into a domesticated cat in no time. Good luck for your tight rope act. It’s like paying EMIs of your under construction house. But here you keep paying EMIs for your entire life and never even get to say a word. Wishing you a happy married life! You are so excited to make your partner happy and loved always. Then you will find out that you did nothing but annoy each other instead. Congratulations! Your laughter will be dead, Your rejoicing will be nullified. There’s going to be just one voice at home now, And that is of your wife’s. Happy married life! Saying I do while getting married is like blindly clicking on the I Accept checkbox while installing new software in your computer. You do it despite having no clue of what will come next. This is the time of your life. You are going to lock down to one woman. Is marriage really marriage? Or is it a way to lock a man? You let me know if anything we will break you out! Marriage – the lone warfare where you have to sleep with your enemy and next day you have to talk happily without caring how much you were disturbed last time. Good luck. Happy Marriage. I grant you wish that you will never forget her Birthday and your anniversary date also you will always have loads of ideas and Money to buy her gifts. At first, sweet moments, kisses and hugs fill the air; soon the sweet nothings and lovely whispers give room for arguments which disappear for quarrel and total war. Congratulations! Congrats on getting married! You two are now forever entwined with some of the craziest moments. You are going to get fat together, complain and be happy. Awesome! The Bar will miss you, the Theater will miss you, and even the free WiFi of MCD will miss you. As you will be Mrs. from today after your wedding. A couple’s life cycle consists of various stages including dating, loving, marrying, fighting, threatening and possibly even divorcing. Congratulations for reaching step number three. Congratulations for embarking on life’s journey called MARRIAGE which is either a two way street between COMPROMISE and SACRIFICE or a one way street to DIVORCE. No one’s ever able to find out a secret about happy married life. I guess it doesn’t even exist. “Happy” Married Life…! In life, it is always good to keep our eyes open, but when you get married, I hope you find the courage to keep them shut. Have a hearty day my dears. We love you. 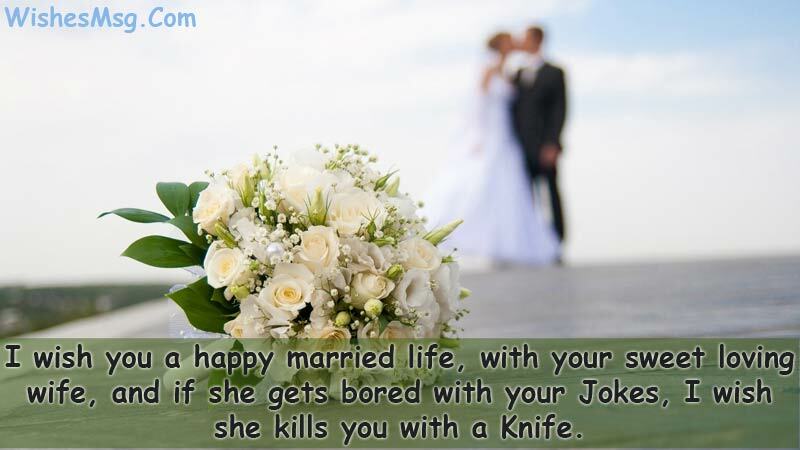 I wish you a happy married life, with your sweet loving wife, and if she gets bored with your Jokes, I wish she kills you with a Knife. Do you know that you are signing a marriage contract which does not give you the option of renewing it every year Congratulations for signing your life away. Well, now it’s the beginning of the end for you. No more beers, no more night out with the guys but at least you have a loving wife. Congrats! You haven’t just tied the knot with your wife today, you have tied ropes on your legs too. 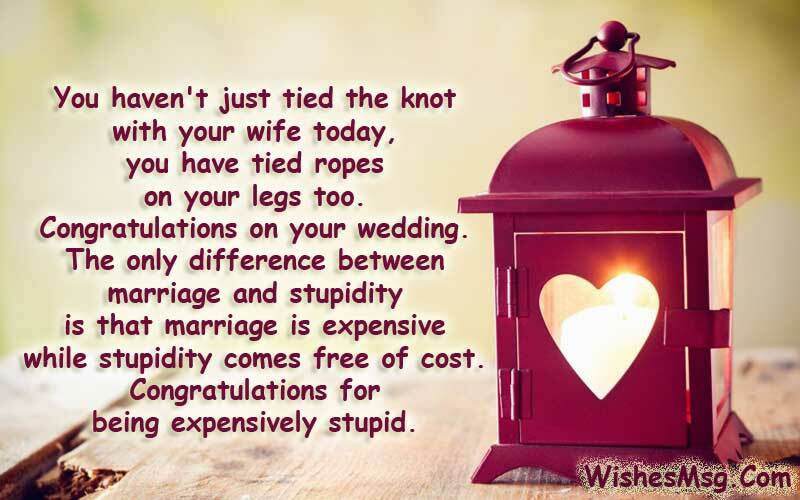 Congratulations on your wedding.The only difference between marriage and stupidity is that marriage is expensive while stupidity comes free of cost. Congratulations for being expensively stupid. Guess you two were madly in love with each other. From now onward it would just be madness. Happy Married Life. At first, both of you are madly in love. Later on, you will find yourself in the middle of a never-ending war. This is what I have to say to you. You are a very brave soul who will endure the marriage life and become better than all of us. Godspeed my friend. We got your back. You will weight some more TON, on your head there will be a SUN, on your front there will be your child’s carriage, and this is how your life will be after marriage. Congratulations on your wedding day… I haven’t bothered buying you both a present. It would just be something else to fight over when you get divorced! Why are wives more dangerous than the Mafia? The mafia wants either your money or life… Wives want both! 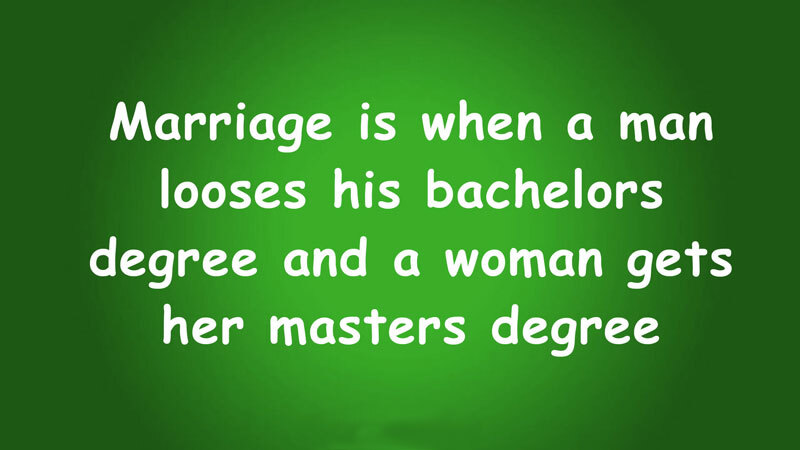 Marriage is when a man looses his bachelors degree and woman gets her masters degree. Getting married is like being in drama school. You get to practice everything from comedy to melodrama to tragedy. Congratulations. You may drop a letter or note to greet the newly wed, either collect some funny wedding wishes to write in a card from this post, also you may share these on social media like Facebook, Pinterest, Google Plus, twitter or any other you have. 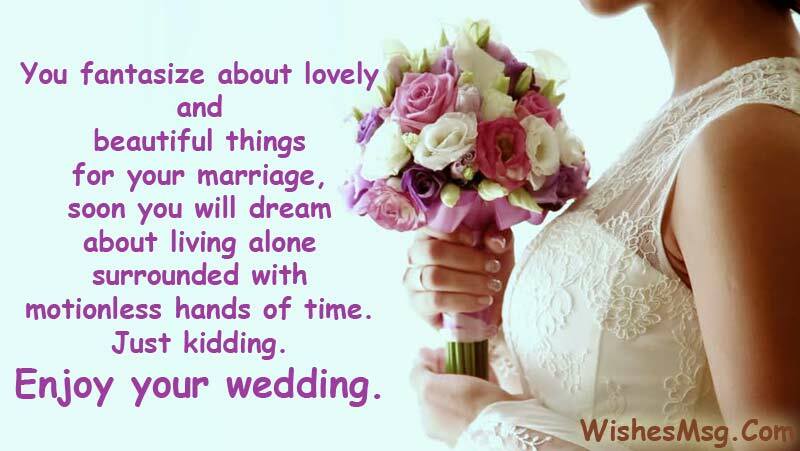 Hope that you will find the best from dozens of funny wedding wishes messages.